Instrumental in developing the “Days of Bread” initiative, Paducah’s second UNESCO Creative Cities collaboration focusing on culinary creativity, Giuseppe recently spent the morning at Kirchhoff’s Bakery making Salt Rising Loaf bread with co-owner, Josh Ryan. The Salt Rising Loaf recipe represents the Kirchhoff’s baking tradition, which has been deeply intertwined with Paducah’s history for generations. In 1873, Prussian immigrant, Franz Kirchhoff, began baking bread in historic downtown using a wood-fired oven and proven family recipes. Today, Kirchhoff’s Bakery continues to combine old world recipes with quality ingredients to make fresh artisan breads. These are the kinds of traditions that make a place unique, according to Giuseppe. “Sometimes it takes someone else to tell you what richness you hold in your own hands,” he explains. A native of Carrara, Italy, Giuseppe began his career as an assistant professor at the University of Pisa (yes, that Pisa) doing mathematical research. An invitation to come to the U.S. for one year to do some collaborating on an IBM project turned into 10 years and a software start-up, a business that continues to this day. As a result of the collaboration through UNESCO the Kirchhoff’s recipe, native to Appalachia, is included along with others of creative cities like Paratay, Brazil, and Parma, Italy both in a print cookbook as well as in a “Days of Bread” app, now free and easily downloadable. It’s all a part of the “Year of Kentucky Food” that promotes what we all know and love about the general deliciousness of the Bluegrass and then sharing that with the rest of the world. Salt rising loaf, a pioneer-style bread with deep roots in Appalachian culture, has spread the length of the Ohio River and is indicative of the complexity, innovation, and joyful love of good food that exists throughout the region. The name ‘salt rising’ sometimes confuses consumers, leading them to believe that the bread has an overly intense salt flavor. 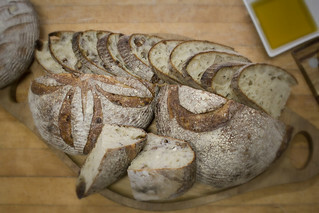 In fact, the bread shares a similar flavor profile with many sourdoughs, and the name comes from the traditional preparation process. In 18th and 19th century Appalachia, yeast was hard to come by. Instead, bakers would use potatoes or cornmeal to get the bread to rise. Making it was a three-day process that involved putting the dough in bowls surrounded by rock salt, which would trap heat from the hearth. Sometimes people would simply leave the bowls in the sun and heat them that way, allowing families to continue with their daily tasks. Salt rising’s tedious three-day baking schedule can be intimidating, but is well worth it, producing a bread that is exciting, unique, and flavorful. 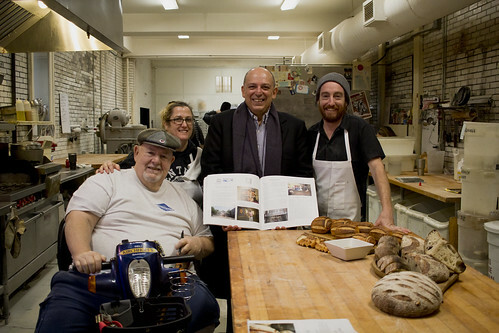 It is with great pride that we continue to bake and serve this bread to our community. Day 1: Let’s do this! • Pour milk into a stockpot and bring it to scalding, NOT boiling. This is very important. Allow the milk to cool for roughly 10 minutes and then stir in the cornmeal and flour. Take your time and stir until the batter has a smooth consistency. • Tradition says to keep this first starter at a consistent 90 degrees Fahrenheit. This can be achieved by using a pilot light or, depending on your location, a very sunny room. Once you have decided where you’re going to house your starter, pour starter into a container to rest. You should allow some room in the container you’ve chosen for growth and bubbling. Day 2: You got this! • Using the original container, combine the water, flour, and baking soda with the starter. Stir until the mixture is batter-like. It should be roughly the same consistency as the mix from Day 1. Return the starter back to its resting place. Remember, the ideal location would be 90 degrees Fahrenheit. Day 3: What’s that smell?! • Pour the starter into the mixing bowl. Sprinkle the top of the starter with yeast. You can add a bit of sugar to it as well. This will help activate the yeast. Give the starter 5-7 minutes to rest with the yeast. Afterward, add the remaining ingredients. • The starter will make almost enough liquid for the dough, so it is important to pay very close attention to the mixer. Start off at a slow speed and watch for dough coming off of the sides of the bowl; add two tablespoons of water to the dough and let mix for 3-4 minutes on low. • Stop your mixer and scrape the sides. You can now increase the speed to medium and mix for 10 minutes. • With the mixing complete, the dough is ready to go into an oiled or sprayed bowl for about 1 hour and 30 minutes. This rest time depends on the temperature of the room you’re in. Adjust as needed. • After the dough has rested, generously flour your workspace and dump the dough. Cut the dough into two equal portions and flatten them into a square or rectangle shape. • Starting at the end furthest away from you, begin rolling the dough toward you. At the end of each roll, tuck ends inward. Once you have run out of dough to roll back, grab the ends nearest you and the other portion of the dough and pinch them together. Repeat with second portion of dough. • Spray your 1 lb loaf pans with a nonstick cooking spray and place the dough in the pans. Cover the filled pans with a damp kitchen towel and let them rest until the dough has risen 1-2 inches over the top of the pan. • While waiting for the dough to rise, pre-heat the oven to 375 degrees Fahrenheit. • Once the dough is roughly 3 inches above the pan, remove towel and place in the preheated oven. Bake for 30 minutes or until golden brown. Check periodically. • After baking, allow the bread to cool in the pans for about 15 minutes and then remove from pans. • Let cool completely before slicing. Pat yourself on the back, you did it!